During a recent family reunion, I came across two icons of Christ, ruler of all– in Greek, Χριστος Παντοκράτωρ (Christos Pantokrator)– that belonged to two different relatives of mine. Since taking a course in New Testament Greek last year, I have become even more fascinated by icons, especially this one, Christos Pantokrator, than I had been previously. 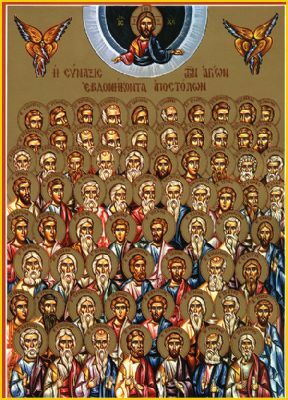 What does the Christos Pantokrator icon have to do with the reading from 1 Peter from tonight’s Evening Prayer, though, and what does it have to do with our lives as religious, as Basilians, as priests or, in my case, as one in formation for ordained priesthood? In the very first verse of the reading from tonight’s Vespers, the author of 1 Peter exhorts us: “Clothe yourselves with humility.” When we look at the icon of Christos Pantokrator, and indeed of many icons of our Lord, he is clothed on the inside with a red garment, symbol of divinity. Overlaying the red, though, is an outer blue garment: Christ’s divinity has been clothed in our humanity. Therefore, by his Incarnation, Jesus Christ assumed our frail nature, of course without losing any of his divine nature. This is a valuable lesson in the virtue of humility. Not only does God show “kindness” toward the humble, but God also shows us concretely the way of humility by becoming one like us, just as the ruler of all once created us in his image and likeness. Humility, I think, is one of the most difficult virtues for most people to practice. Perhaps this is because of the greatness of our human nature. One of my favourite Psalms, Psalm 8, praises God thus for the creation of human beings: “You have made them little less than a god.” I know all too well by experience that this nearness to divine essence with which we have been created so easily leads to misplaced ambition and hubris. I am the last person who should be leading a reflection about humility! When Jesus’ own Apostles let their pride get in the way of acceptance of the Cross– of giving everything they were in hope of the Kingdom of God– Jesus reminded them of their place in bringing about that Kingdom. Examples abound of Jesus reminding the Twelve– and us– of the humility with which he himself lived. The most striking instance of this to me is when he placed a child among his followers, who had been quarrelling over who among them was the greatest. As I was leaving the Vancouver airport to come home to Toronto just days ago, my two-year-old niece provided me with a reminder of humility clothed in godlike dignity. As I held her and said, “Bye, Molly, I love you,” she laid a big, sloppy kiss on my cheek that brought tears to my eyes. If Molly were to be represented in an icon, she would be wearing a blue inner garment draped in red which, of course, is how our humble Queen and Mother, Mary, is often depicted. Out of the mouth of this babe, to paraphrase Psalm 8 again, came a defence “to silence the enemy” that is pride, which deludes us into thinking that we do not need God. This reflection was originally given during Evening Prayer (Vespers) of August 31, 2011, during a retreat of the Basilian Fathers’ Scholasticate in which I am currently living. These words of the LORD clearly were assigned a place of prominence; they were to be fixed as the primary focus on the hearts, on the homes, on the heads, and on the bodies, specifically the wrists, of the faithful. Similarly, Jesus affirms for us in today`s Gospel that this prayer leads us to a deepened faith, again illustrating for us the notion of lex orandi, lex credendi. That faith gives rise to a love of God that becomes affixed in our hearts, in our innermost homes that are our souls, in our minds, and in our bodies wherein lay our strength. In its original context in Leviticus, the scope of this second of the greatest Commandments is restricted to the Israelites’ “fellow countrymen,” those bound to the covenant between the LORD and Israel. However, Jesus challenges us to broaden our horizon of who our neighbour is. Of course, we need not to walk too far through downtown Toronto to have our concept of neighbour challenged: near to here we find the poor, the mentally ill, the addicts, the newcomers and refugees. Jesus reminds us that these, too, are our neighbours. One cannot be said to love God without loving these people, often the least valued and most forgotten of our preoccupied, capital-oriented society. Even amid our pride and our failure at times to see the least among us as our neighbour, though, Jesus still tells us comfortingly, “You are not far from the kingdom of God.” How, then, do we make up this distance from God’s kingdom? On our own, entrance into God’s kingdom is impossible. Only in relationship with God, through consistent prayer, will our weakness, our divided hearts, and our distance from God be overcome, and will we come to see our neighbour, and God, for who they truly are. That regularity in prayer is the point of the Shema. By praying the Law enjoined on us, we will gradually come to believe in that which we pray: lex orandi, lex credendi. Then, that in which, or better yet in whom, we come to believe, God through an expanded notion of neighbour, we will come more fully to love. The Shema– Hear, O Israel! http://www.hebrew4christians.com/Scripture/Torah/The_Shema/the_shema. html. Accessed 30 March 2011. See also Deuteronomy 6:4. Judaism 101: A List of the 613 Mitzvot (Commandments). http://www.jewfaq.org/613.htm. Accessed 30 March 2011. 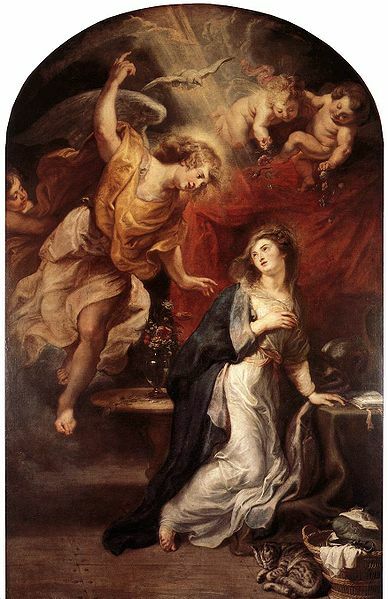 …And now, a brief announcement… “The Holy Spirit [has] come upon [us], and the power of the Most High [overshadows us].” Nine months from today, we will celebrate Jesus’ Nativity, but the process of our bearing Christ into our world begins now, as we celebrate this Solemnity of the Annunciation of our Lord. We are urged, then, to begin, if we have not already begun, to be converted and to open our hearts and minds to renewal, to be better disposed to do the will of God… End of announcement. Looking over my notes for the Liturgical Presiding practicum, I saw that our class had been told clearly about proper brevity and placement of announcements within the order of the Mass. Announcements are to be made where a natural break occurs within the Mass, for instance between the reception of Communion and the Concluding Rites, so as not to be disruptive to the flow of the liturgy. Amid our activities outside of the Mass, although in a different way than at Mass, announcements can be timely and humourous, thought-provoking, or even inspiring. For example, a creative television commercial may make one laugh or be likely to buy a product or adopt a lifestyle change. More deeply, the expected birth of a child within a family, announced during a family dinner, is a message of remarkable beauty. However, many announcements are ill-timed, too long, repetitive, or disruptive, whether within or outside of Mass. Let us return to the examples of the television commercial and the pregnancy announcement. Some commercials are effective by their repetition in moving us to buy the products advertised, yet I detest seeing the same commercial multiple times in a row, unless it is a profoundly creative use of thirty seconds. Such a recurrent announcement is disruptive to whatever show I am trying to watch. How might the announcement of an impending birth of a child be as disruptive, albeit in a different way, as the repetitious or dull television commercial? Today’s Gospel, I think, answers that question. I imagined upon re-reading Luke’s infancy narrative that I had been given the role of evaluating the Angel Gabriel’s technique in Liturgical Presiding. I do indeed have a similar assignment for the class I am in; for it I took notes on last Sunday’s Mass at Our Lady of Perpetual Help Parish in Sherwood Park, Alberta, Canada. The presider was not an angel. If Gabriel were not an angel and if this were a Mass, the little Pharisee in me concerned with liturgical rubrics would have had a lot to say. In class, we are reminded not to begin Mass with a secular greeting in place of a “sacred” one, and thus to begin in the name of the Father, of the Son, and of the Holy Spirit, and then “The Lord be with you.” Poor Gabriel gets off to a bad start here: “Hail, full of grace.” The Greek imperative Χαῖρε, which we read as “Hail,” can also mean “Rejoice” or a simple, underwhelming “Hello!” No wonder Mary found Gabriel’s salutation disconcerting! Then Gabriel proceeds to make a verbose and unfocused announcement. He not only tells Mary that she will bear a child, but that the barren Elizabeth will as well. Then Gabriel simply departs from the scene. If I had been in Mary’s place, I, like her, would have been “greatly perplexed.” Herein, though, lies the success of Gabriel’s announcement: It allows for Mary’s participation in the narrative, much as the participation of the People of God during Mass contributes to good liturgy. “Eucharistic Liturgy.” Course notes handout, Liturgical Presiding, SMP 3165 HS (Toronto: University of St. Michael’s College, 23 January 2011). Dennis C. Smolarski, How Not to Say Mass: A Guidebook on Liturgical Principles and the Roman Missal, 2nd ed. (New York, NY/ Mahwah, NJ: Paulist Press, 2003), 51. Back on 25 March 2009, I began my last post on a section of the Gospel of Luke with a flashback to the Annunciation, the event recounted in the opening chapter of Luke when the Angel Gabriel announces to the Virgin Mary that she would bear a son, Jesus, “Son of the Most High” (Luke 1:32). Gabriel’s message is one of great joy: “Hail, favoured one! The Lord is with you,” yet Mary is said by Luke to be “greatly troubled” by it (vv 28-29). This episode ends with Mary’s joyful acceptance of God’s will for her: “Behold, I am the handmaid of the Lord. May it be done to me according to your word” (v 38). At those words, though, in characteristically Lukan fashion, Gabriel exits the scene and Mary is left alone. The joy of the occasion is combined with anxiety. Throughout Luke’s Gospel, the experience of discipleship is one of joy amid crisis. That combination of joy and of crisis is again at the forefront at the close of Luke’s infancy narrative. As the prophetess Anna exhibits the mark of a true disciple by her ceaseless prayer in the Temple, Simeon, even while he blesses the Holy Family who has come to Jerusalem to present the Child Jesus to the Lord, predicts ominously: “Behold, this child is destined for the fall and rise of many in Israel, and to be a sign that will be contradicted (and you yourself a sword will pierce) so that the thoughts of many hearts will be revealed” (Luke 2:34-35). Joy abounds as the anticipated “redemption of Israel” (v 25) is fulfilled by the Incarnation of the Son of God, yet from a young age Jesus knows that He “must be in [His] Father’s house” (v 49). He must complete His mission that will culminate on a cross in Jerusalem, the city upon which the Lukan Gospel is focused. Christ’s Passion and death on that cross, though, will not be the end. At Emmaus the Risen Jesus opens the hearts and minds of His fearful disciples to the Scriptures (Luke 24:32, 45) and to His presence “in the breaking of the bread” (v 35). Then, as He ascends to the Father, Jesus directs His disciples back to Jerusalem where they will receive the Holy Spirit and will be sent forth as His witnesses (Luke 24:50-53; Acts 1:8, 2:1-4). Thus begins the mission of the Church. Like the earthly life of Our Lord, the era of the Church has been marked by joy and by crisis, and like the early disciples in Luke’s account we must orient ourselves toward the Holy City. Indeed, as Christ set His face toward that goal (Luke 9:51), we must set ours toward the Heavenly Jerusalem. We are promised success in our Christian vocation, even while on earth we await the eternal bliss of heaven. Our earthly joy in God’s presence is intrinsic to our divine call to discipleship, a mission of which none of us are worthy. Simon Peter, the first of the Twelve chosen by Jesus to follow Him according to Luke, encountered his own sinfulness on the shore of the Lake of Gennesaret (Luke 5:8). Peter’s sorrow, fear, and incomprehension in the presence of the holy are transformed by Jesus into joy and reassurance as the Rock of the Apostles is sent forth: “From now on, you will be catching [people]” (v 10). Jesus, though, is not content to send only Peter in His stead; twelve Apostles are selected “to proclaim the Kingdom of God and to heal the sick” (Luke 9:1-2) Jesus clarifies that the mission of the Twelve will be demanding; they are to “take nothing for the journey, neither walking stick, nor food, nor money, and… no one” is to “take a second tunic” (v 3) Our Lord’s commissioning of the Twelve begins Chapter nine of the Gospel of Luke. In that chapter, the Twelve grapple with the Messianic identity of their divine Master (vv 18-21). This Messiah predicts His death twice in the same chapter (vv 22 43b-45), leaving His Apostles confused and frightened. Jesus is transfigured before Peter, James, and John in a tremendous theophany in which the Son of God is affirmed by His heavenly Father: “This is my chosen Son; listen to Him” (v 35). However, even the Transfiguration unmistakeably points toward Jesus’ “exodus” (v 31); the Gospel’s climax, Jesus’ death outside Jerusalem, is again vividly foreshadowed. Even the most fervent disciple would find the demands of fellowship in this Messiah difficult. After the awe-filled Transfiguration, the Twelve experience repeated failure in living the mission that they were sent to accomplish. Commissioned to heal the sick, they are not able to cure the demoniac child; their faith is no greater than that of the “faithless and perverse generation” (v 41) to which they belong. Jesus’ command to take nothing with them and to rely on God’s providence is neglected as the disciples clash over which one among them is greatest (vv 46-48). Instead of welcoming the outcast– they were to enter into the houses of the people on their way and build Christ’s kingdom of peace– they exclude the foreign exorcist (vv 49-50). Jesus, though, presses on. Despite differences in wording and in order between the prohibitions in Luke 9:3 and 10:4, the message of both verses is essentially identical: discipleship in Christ requires total reliance on God, thus detachment from three sources of material security, whatever temporary good these might yield. The first of these sources is financial gain, symbolized by money and the sack in which to store it. The second, represented by the walking stick or by greeting people “along the way,” is adherence to a particular place or dependence upon particular people for happiness. The third source is attachment to goods– not only to clothing– indicated by the tunic or by the sandals. Firstly, by these orders to His two sets of disciples, the Twelve and the Seventy, Jesus does not advocate destitution. In fact, Our Lord affirms in Luke 10:7 that “the labourer deserves his payment.” To deny the remuneration due a worker is a grave injustice: “Behold, the wages you withheld from the workers who harvested your fields are crying aloud, and the cries of the harvesters have reached the ears of the Lord of hosts” (James 5:4). Secondly, neither does Jesus teach against close interpersonal relationships, or against a desire to serve in a specific environment. From my own perspective of religious life, for instance, I am frequently asked by friends, relatives, former students, and confrères alike whether I would want to return someday to our Basilian community in Colombia in which I last served over two years ago. I respond to such questions that I would go without reserve if called to serve there again. In six months in Cali, the people of our Congregation’s parish and school there taught me about true poverty: out of their material nothingness came a deep joy and faith that filled my comparative void and that continues to sustain me spiritually to this day. By the grace of God, though, I have also experienced great joy in Basilian community, whether in Edmonton, Cali, Windsor, or Toronto. I am open to service in any apostolate to which I am appointed, and I pray that this might always be so. Thirdly, by barring His disciples from carrying a second tunic or sandals, Jesus does not teach that to be well-attired is contrary to Christian fellowship. He does, though, urge simplicity of a pilgrim people. Money, friendship, a place to live and to work, and physical belongings are all necessary, but a Christian disciple must not regard these passing earthly goods as greater than the enduring good that awaits us in heaven. The Church, with Jesus Christ as her Master and Guide, aims higher still… The things of earth cannot be understood or valued aright without taking into consideration the life to come, the life that will know no death. The valuation of eternal life over any finite earthly good is at the core of Jesus’ instruction as He commissions the Twelve and then the Seventy. Elsewhere in the Gospels, the same message is proclaimed even more clearly: “Seek first the Kingdom of God and His righteousness, and all these things will be given you besides” (Matt 6:33). Upon sending forth the Twelve as well as the Seventy, Jesus stresses confidence in God over material possessions and even over other persons who might welcome His disciples along their way. The same instructions are conveyed in similar vocabulary and order, yet one ought not to dismiss as insignificant the true differences between Jesus’ words at the commissioning of the Twelve and of the Seventy. For example, Jesus’ more urgent exhortation to the Seventy in Luke 10:2, “the harvest is abundant but the labourers are few, so ask the Master of the harvest to send out labourers for His harvest,” is entirely absent from His directions to the Twelve in Luke 9. The following verse, a warning to the Seventy that they will be “like lambs among wolves,” also is not paralleled at the beginning of Luke’s previous chapter. However, comparable orders to those in Luke 10:1-16 are given by Jesus in the Gospel of Matthew. No parallel of any of Luke’s sending of the Seventy is found in Mark’s Gospel. Some sayings in Luke 9, such as Jesus’ mandate to the Twelve, are much less detailed than in Luke’s following chapter: “Whatever house you enter, stay there and leave from there. And as for those who do not welcome you… shake the dust from your feet in testimony against them” (Luke 9:5). In Luke 10, this directive is more expansive; the Seventy are to accept and to return the hospitality of the “peaceful person” (Luke 10:6)– literally the “son of peace”– and the proclamation of the imminence of the “Kingdom of God” (vv 9, 11) is to follow whether or not the disciples are welcomed in the towns through which they travel. These noteworthy discrepancies between the beginnings of Luke 9 and 10, and parallels or lack thereof between Luke 10:1-16 and passages in the other Synoptic Gospels, suggest that Luke’s accounts of the commissioning of the Twelve and of the Seventy stem from different sources. Matthew, Mark, and Luke all share the account of the sending out of the Twelve, although Matthew’s version of this pericope is arranged differently than those of Mark and of Luke. In cases where a passage is included in all three Synoptic Gospels or in Mark and either Matthew or Luke, most Biblical scholars assume Markan priority– that is, that Matthew, Luke, or both used Mark, whose Gospel is held to have been the first to have been written, as their documentary source about the life of Christ. Material shared by Matthew, Mark, and Luke, known as “triple tradition,” makes up approximately five hundred verses, or about three quarters of Mark, forty-five percent of Matthew, and forty-one percent of Luke. Moreover, ninety-one percent of Mark is also paralleled in Matthew, in Luke, or in both of these other Synoptic Gospels. While these parallels in wording and often in arrangement between the Synoptics can be explained by Markan priority, this theory does not account for “double tradition” material, found in Matthew and in Luke but not in Mark. These nearly two-hundred-fifty verses of double tradition, of which Mark could not have been a source, comprise almost a quarter of the Gospel of Matthew and over one fifth of the Gospel of Luke. A majority of scholars theorize that the origin of this double tradition is a non-extant document called “Q,” after the German word quelle, which means “source.” Chief among many arguments against the Q hypothesis by a strong minority of Scripture scholars is that Q, a theoretical written collection of sayings of Jesus, compiled from oral tradition and probably lacking Nativity and Passion narratives, has yet to be discovered. M and L content are important to the distinctive order and structure of the Gospels of Matthew and of Luke, respectively. In the case of Luke 10, a verse of material found only in Luke begins both a new chapter in that Gospel and a new pericope: “After this the Lord appointed seventy [-two] others whom he sent ahead of him in pairs to every town and place he intended to visit” (Luke 10:1). Such verses as this, which represent clear breaks between pericopes, are called seams. Matthean seam verses, including the evangelist’s adaptation of Old Testament texts, are more often M content than are Lukan seams comprised of L text. In the Gospel of Matthew, M material seams follow particular formulas, two examples of which are “fulfillment citations” and use of contrast between the sayings of Jesus and the commandments of the Old Testament. Matthean fulfillment citations, wherein events occur to fulfill “what the Lord had said through [a] prophet,” introduce or conclude six pericopes between Matthew’s infancy narrative and the beginning of his account of Jesus’ nascent Galilean ministry. The latter form of Matthean seam is found six times in a section of the Sermon on the Mount often called the “antitheses,” in which Jesus cites a tenet of Mosaic Law, prefaced by the phrase, “You have heard that it was said…” Then, Jesus interprets each statute for His own audience: “But I say to you…” Here, Jesus is not portrayed as abolishing the Law, but, as Matthew writes, in fulfillment of it (Matt 5:17). Thus, like Matthew’s fulfillment citations, the so-called antitheses– not true antithetical pairings of Moses’ Law and Jesus’ teachings, as if Jesus were attempting to supersede the Torah, but Rabbinic applications of the Torah to the social situation of Jesus’, or more likely Matthew’s, hearers– present Jesus in continuity with Israel’s religious and legal tradition. Unlike Matthew, Luke’s inclusion of Old Testament citations is rare, as are L material seams as opposed to M seams in Matthew. Where L seams occur in Luke, their break from the preceding pericope and led into the subsequent text are subtle. For example, Luke 10:1, an L verse, continues on the theme of the demands of discipleship presented in the triplet of proverbs in Luke 9:57-62. Discipleship is the central thesis through to Jesus’ blessing of the seventy in Luke 10:23-24. Nevertheless, Luke 10:1 is a break from the texts that precede and succeed it. Luke 9:57-62 and 10:2-16 is shared by Matthew and is therefore Q material with important Lukan modifications. I turn now to the final four verses of this sequence of Q sayings in which Jesus condemns towns whose people have not accepted His message. Those towns, Chorazin, Bethsaida, and Capernaum, are contrasted with Tyre and Sidon, cities that would have repented readily given the same opportunity to hear Jesus as were the three Galilean communities. Especially in comparison with the larger pagan centres of Tyre and Sidon, Chorazin, Bethsaida, and Capernaum were small fishing villages near the shore of the Sea of Galilee in the first-century C.E. Jesus’ denunciation of these particular communities for their rejection of His preaching of God’s Kingdom, then, as opposed to larger towns where He had been, seems quite harsh. Of these villages, Capernaum is alluded to most often in Luke– four times (4:23, 31; 7:1; 10:15). It was, despite its small size, a main centre of Jesus’ teaching ministry. It had presumably had more opportunities than other villages in its vicinity to reject Jesus. Evidently from Luke’s account, Capernaum had developed a worse reputation than other nearby villages for declining to receive Jesus’ Gospel of the Kingdom. Thus, it draws the starkest condemnation: “As for you, Capernaum, ‘Will you be exalted to heaven? You will go down into the netherworld’” (Luke 10:15). As poor as Capernaum’s reputation may have been, though, it was not, even for Luke, entirely depraved. Jesus’ first miracle there according to Luke is well-received; the people of Capernaum recognize Jesus’ authority (Luke 5:32) and rapidly spread the news (v 37) of His healing of a demoniac (vv 33-35) and teaching in their synagogue (v 31). Luke mentions Chorazin only once in his Gospel (Luke 10:13), while he refers to Bethsaida twice (Luke 9:10, as site of the Feeding of the Five Thousand, and 10:13). Why, then, such insignificant villages draw such a scathing rebuke in Luke 10:13-16 remains a mystery. Nonetheless, the message of this pericope is clear: Jesus’ human disciples, whether the Twelve or the Seventy, have been given divine authority to herald the inauguration of God’s kingdom. To fail to heed their message is to reject Christ, and therefore whoever rejects the Son of God, mediator between the divine and human as He is fully both, rejects God the Father. If one reads no further than Luke 10:16, the tone of the Lukan account of the mission of the Seventy would suggest their utter failure. If those sent “ahead of [Jesus] to every town… He intended to visit” (Luke 10:1) had been unable to elicit repentance in three tiny fishing communities, their success would have been even less likely in larger towns, yet the Seventy return to their Lord rejoicing: “Lord, even the demons are subject to us because of your name” (v 17). Their joy is not inappropriate; the Seventy recognize that their power to exorcise demons comes from Christ (Luke 9:1). However, Jesus warns them, “Do not rejoice because the spirits are subject to you, but rejoice because your names are written in heaven.” (Luke 10:20) Insofar as Jesus’ disciples have been empowered to participate in bringing to fulfillment the reign of God on earth, it has already been established in Christ. Satan, cast in Luke 10:18 as the “adversary”– the “prosecuting attourney,” writes John L. McKenzie, of late Old Testament prophecy and wisdom traditions– has already fallen “like lightning from the sky” (v 18). Jesus’ disciples are promised that they will conquer even “serpents and scorpions,” and that nothing will harm” them (v 19). This promise is not a prediction by Jesus or by the evangelist of an end to persecution of Jesus’ followers. That has yet to occur, and if this latest “century of martyrs” is any indication, maltreatment of Christians is on the increase. Instead, Luke’s message is that Jesus has provided for His disciples’ eternal welfare. Although Satan’s tyranny is still very much active in the world, it will be brought to an end with the eschaton, a process that is already underway. Following his admonition of the Seventy, newly-returned from their successful mission of evangelization, Jesus takes His turn to rejoice in prayer. McKenzie notes that Luke 10:21-22 parallels Matthew 11:25-27 almost exactly, with one important Lukan addition: Luke “alone mentions the rejoicing of Jesus in the Spirit.” This allusion to the Holy Spirit is characteristic of Luke and of Acts. At Jesus’ Ascension in Acts, the Apostles are reminded of our Lord’s own Baptism “with the Holy Spirit.” That Baptism is then conferred upon them; in the Holy Spirit they are to be Christ’s witnesses “to the ends of the earth” (Acts 1:8) Luke often presents the Holy Spirit together with the Father and the Son. Three examples come to mind of this Trinitarian tendency of Luke: The first is his account of Jesus Baptism, during which the Holy Spirit descends on Jesus while “a voice from heaven,” that of the Father, declares that in His Son He is “well pleased.” (Luke 3:21-22) The second is the Transfiguration (Luke 9:28-36), in which some consider the cloud (v 34) to be a reference to the Spirit, and the voice that says, “This is my chosen Son” (v 35), to be that of the Father. Jesus is present, of course, as a man. The third instance in Luke of the presentation of the whole Trinity in the same pericope is in Luke 10:21-22. Here, Jesus’ praise of the Father for His revelation to the “childlike” (v 21) is prefaced by Christ’s joy in the Holy Spirit. These and other Lukan texts have therefore been used to support Trinitarian theology and in particular the divinity of the Holy Spirit. These dogmas, universal among Christians today, were disputed questions in the fourth century. The Council of Constantinople in 381, drawing especially upon the theology of the Cappadocian Fathers, Sts. Gregory Nazianzen, Basil of Caesarea, and Gregory of Nyssa, affirmed that the Spirit is equal in divinity to the Father and the Son. Although St. Basil never cited Luke 10:21 specifically in his formative work De Spiritu Sancto to argue that the Holy Spirit is divine, this verse is used liturgically to this day by various Christian churches on the feast day of Sts. Basil and Gregory Nazianzen. I began this article by recalling the Annunciation, a moment of great blessing told by Luke, and I conclude on this day before Christmas, another such moment. The announcement to Mary that she would bring Christ our Saviour into the world was at the same time a joyful and a troubling mystery. Likewise, the discipleship in Christ to which we are continually called brings with it experiences of blessing, of struggle, of joy, and of crisis. Let us pray as we celebrate our Lord’s Nativity for those who struggle in their faith, and for the persecuted, that they might be truly blessed. Let us also pray for those whose encounter with Christ, wisdom of God, who comes to us as a baby in a manger and will come again, has impelled them to proclaim the Gospel with joy. We, the disciples of Christ after the Twelve and the Seventy, await with this same joy the blessing of God that lasts forever. Amen. Leo XIII, “Rerum Novarum No. 21.” http://www.vatican.va/holy_father/leo_xiii/encyclicals/documents/hf_l-xiii_enc_15051891_rerum-novarum_en.html. Accessed 25 July 2010. See Matthew 9:37-38, 10:7-16. The sayings of Jesus to His disciples found in Matthew differ in arrangement from those in Luke 10. John L. McKenzie, “The Gospel According to Luke,” in The Jerome Biblical Commentary, edited by Raymond E. Brown, Joseph A. Fitzmyer, and Roland E. Murphy, 2:143 (Englewood Cliffs, NJ: Prentice-Hall, 1968). Matthew parallels these “Kingdom of God” sayings found in Luke 10:9, 11. See Matthew 10:7, although note that Matthew prefers “Kingdom of heaven” to Luke’s “Kingdom of God.” See Philip P. Kapusta, “The ‘Kingdom of Heaven’ Versus the ‘Kingdom of God:’ Two Kingdoms, or One?” http://www.bibletopics.com/biblestudy/157.htm. Accessed 24 December, 2010. Colleen Shantz, “Redaction Criticism and the Gospel of Matthew,” Class Notes, SMB 1501 HS: Introduction to the Study of the New Testament, University of St. Michael’s College, Toronto, Ontario, Canada, 28 January, 2010. Unless otherwise noted, these course notes are my source for definitions (especially double and triple tradition, Q, M, and L content) and figures I discuss in this section, such as the percentages of triple and double tradition found in each of the Synoptic Gospels. Bart D. Ehrman, The New Testament: A Historical Introduction to the Early Christian Writings, 4th ed. (New York/Oxford: Oxford University Press, 2008), 94. These pericopes are the birth of Jesus (Matt 1:18-25) visit of the Magi (2:1-12), the flight of Mary, Joseph, and Jesus to Egypt (vv 13-15), the massacre of the infants (vv 16-18), the Holy Family’s return from Egypt (vv 19-23), and the beginning of the Galilean ministry (4:12-17). Seam verses (also fulfillment citations) are Matthew 1:23; 2:6, 15, 18, 23, and 4:15-16. Anna Wierzbicka, What Did Jesus Mean? Explaining the Sermon on the Mount and the Parables in Simple and Universal Human Concepts (New York: Oxford University Press, 2001), 65. McKenzie, “The Gospel According to Luke,” 2:143. Bible Gateway, “Keyword Search Results: Capernaum,” http://www.biblegateway.com/keyword/?search=Capernaum&version1=31&searchtype=all&limit=none&wholewordsonly=no. Accessed 23 December 2010. H.W. Crocker, Triumph: The Power and the Glory of the Catholic Church, a 2,000-year History (New York: Three Rivers Press, 2001), 377. “Eschaton” is from Greek, referring to the “last things”; the term is synonymous with the end times. Ibid. Luke and Acts are held to have been written by the same author. “Readings for the Feast of St. Basil the Great,” http://www.liturgies.net/saints/0614basil/readings.htm. This site lists Catholic as well as Orthodox and Anglican liturgies and prayers. Roman Catholics celebrate the feast of Sts. Basil and Gregory on January 2; otherwise this feast is observed on June 14. D. Rebecca Dinovo, “Developing a Biblical Sophia Christology.” http://www.franciscan-anglican. com/Sophia.htm#_ftn12. Accessed 24 December 2010.